The inaugural Fort Wayne Dragon Boat races are coming to River Palooza. Proceeds will benefit Cancer Services. Headwaters Park West, 330 S. Clinton St.
Be sure to visit the Cancer Services booth where you can purchase a flower in honor of a friend or loved one to float in the river. There will be live music and entertainment, food trucks, souvenirs, a kid’s play area, face painting and games. Please visit www.riverpaloozafw.org for more information and maps showing where to park. The big event is tomorrow! If you haven’t gotten your tickets for Bust a Move yet, there are a few remaining online. Get yours today as tickets will NOT be available at the door. Today’s video features artist Kathy Minnich talking about why this project is meaningful to her. Check it out and the other videos on our YouTube channel. See you tomorrow! Bust a Move is one week from today and we can’t wait. Check out the latest video in the series on our YouTube channel promoting this year’s Bust a Move event that brings breast cancer survivors, artists, and cancer community members together to celebrate their triumph and remember the struggles they’ve experienced. This video is part of a series on our YouTube channel promoting this year’s Bust a Move event that brings breast cancer survivors, artists, and cancer community members together to celebrate their triumph and remember the struggles they’ve experienced. talented Amy Keller of Just Sue Graphic Design. We crossed the finish line of our 10th Annual Lapper & Survivors Day here at Cancer Services of Northeast Indiana. 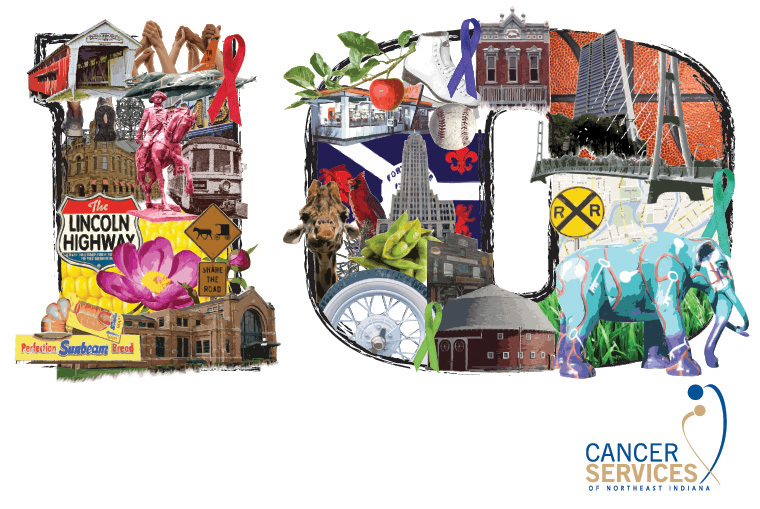 May 19 proved to be a wonderful (and very sunny) day for our cancer community. Both new and familiar faces gathered together to raise money, awareness and friends to support our mission. Nearly 600 people rallied in support of people with cancer and to celebrate life. The energetic crowd included many friends of our organization such as clients, neighbors, sponsors, board members, staff, and dedicated volunteers. It was especially touching to see clients of Cancer Services with their entourage walking side by side. Before the Lapper, everyone assembled to hear the inspiring words of Lapper founder, Jill Burnett. It was a special moment as we recognized the 10th anniversary of this growing event. With those words at heart, the vast crowd took its first steps and formed an impressive sight as we marched through Brotherhood Place Office Park. Following the Lapper, people gathered at the party tent for Survivors Day and facility tours. Guests cooled off with frozen treats from Edy’s and refueled with food from Chick-fil-A and Jamison. Music, chair massages, bounce houses, face painting, cheerful clowns, balloon animals, and more all rounded out the festivities. What a party! We’re proud to have raised over $65,500 which directly benefits cancer patients in Northeast Indiana. Donations will impact your neighbors, your family and your community. Proceeds from the event will benefit programs supporting individuals in our community who are affected by cancer. Each year Cancer Services helps over 2,300 individuals and their families by providing financial assistance, medical supplies and equipment, and emotional support. Stretching our limits during the Lapper walk and celebrating life at Survivors Day are positive ways to support people on the cancer journey and honor the lives of loved ones. We’re grateful to all who were part of this experience and hope to walk alongside you again next year. Here’s to a healthful and healing year ahead. Let’s start training for 2013! A recent study published in The Journal of the American Medical Association contends that weightlifting may be beneficial for breast cancer survivors. 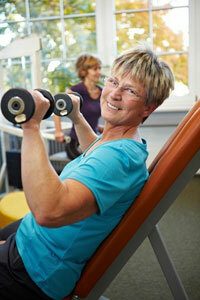 The study also sheds light on the cancer preventative benefits of weight lifting. Want to know more? Read the full study here. Support Groups are great places to share information and support your fellow cancer sojourners. One night, Tom shared with the group that we could choose to be the pigeon or the statue. He wasn’t talking about the merits of flying versus being rock solid. He was talking about our choice to be either the victor or the victim. There are certainly lots of times during cancer and the treatments when we may feel put upon. But the only way to survive is to fly like a pigeon. To be alive. To make choices. To not become the statue that all the pigeons roost upon. Which is it for you? 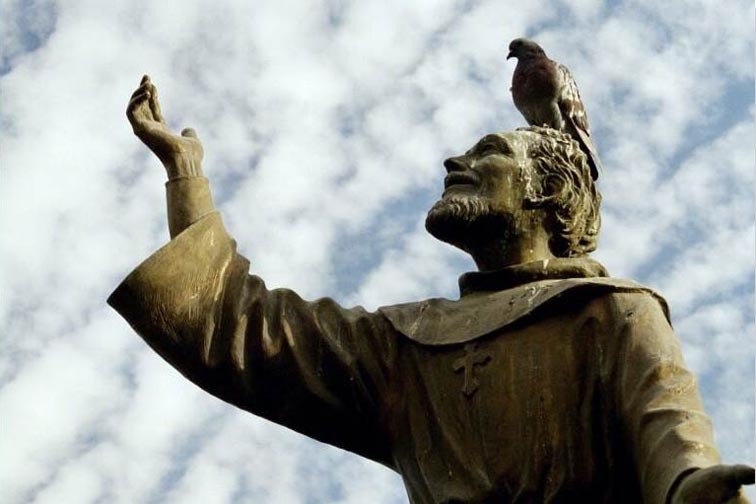 Will you be the pigeon or the statue?